How Do Treadmill Sprint Workouts Help Burn Calories and Boost Energy? By adding some sessions of treadmill sprint workouts to your weekly routine you can effectively improve your overall health and fitness level at a much faster rate. Studies show that sprint training helps to burn calories, increase metabolism, improve muscle strength and explosive power, and improve cardio-vascular conditioning. While that’s all good, you should be in good shape before you start doing them, however, since running sprints is harder on the joints and knees then simply walking or doing light jogging. 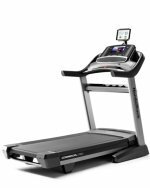 Many treadmills are pre-loaded with Speed and Interval Programs and some treadmills offer a feature to let you input a Custom Program if you want to design your own treadmill sprint workouts. Programs are the best way to train this way so that you can avoid the Manual setting problem where you have to keep the speed button pressed down while trying to maintain your balance on the belt that’s increasing in speed. Another thing to keep in mind is that what you can do on an indoor or outdoor track cannot be replicated on a treadmill. A couple of years ago, Runner’s World magazine tested different treadmills and found that the fast accelerating belts took a full 16 seconds to go from 0 to 10 mph. A world class sprinter reaches his top speed in about 7 seconds, so any discussion of treadmill sprint workouts has to include the 20 seconds to both built up belt speed as well as slow it down again after the sprint phase is over. Sprints are nothing more than short bursts of speed. What you are trying to do is a 20-minute workout with 5 or 6 sprint phases of 30 seconds each, or up to 30 minutes with 8 or 10 sprints of 30 seconds. A pre-set program should give you a brisk walk or light jog for a few minutes, then an all-out run for 30 seconds, then return to the light jog. The jogging pace will be the “rest” periods where your heart rate gets back to a lower rate. You may have to scale back the top speed if it is too much for you to handle at first. For many average people, their own physical speed limit may be only 7 or 8 mph, so they don’t need the belt running at its top mechanical speed of 10 or 12 mph. It takes some self-pacing to run treadmill sprint workouts. Always keep safety in mind first since you don’t want to stumble and fall off a treadmill belt moving at high speed.